When I decided to pursue a big, hairy, audacious goal of competing in the Ironman World Championships as an amateur, non-triathlete, my first thought was, “I’m pursuing something I’ve never done before, perhaps I should enlist the help of a professional coach.” I had never hired a coach before and I discovered it was the difference-maker between success and failure along with several additional benefits. The biggest of which was it positively impacted my leadership ability in ways I never achieved before. For years, I had been a leader of others, helping them to think better and bring out their best. And, experienced a high level of success through grit, determination, drive and tenacity. What I didn’t realize is I could have been and done so much more with a coach. When I began Ironman training, I was a successful leader, consistently moving up, taking on increasing responsibilities, and always coming through with results. What I learned through my coach is that they could see things I couldn’t on my own. It was like a dust-free mirror held in front of my face showing my reflection. What I saw was a confident, accomplished person that could no longer achieve results using the same method. I went from a recreational athlete, working out 5 times per week, to pursuing the toughest race in the world and becoming something I had never been before—a triathlete. This experience dropped me to my knees (literally) because I had to learn how to swim and bicycle properly, and take training to a level of 2-3 workouts per day, a total of up to 24 hours per week AND keep my schedule at work. To achieve my goal, I had to enlist the help of others and could no longer say, “I’m good, I’ll get it done, no problem” and then rely on only myself to push the results forward through people. I had to ask them questions as to the ways they saw to get things done faster and better, opening up my own feeling of vulnerability because I always saw a strong leader as someone who had the answers; didn’t need to ask others questions. 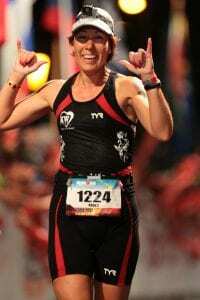 Through my Ironman training experience, I had to become a learner again, instead of a teller. So often in leadership, we rise to the top because we are good at something and we default into telling others how to do it, to also be successful. This is the old model of apprentice leadership, originally created by the military. You can see why it worked in the military, but missed the mark in business by creating a low level of potential results, stifling talented team members to do their best and think better than the leader. In expanding my comfort zone athletically, I also expanded my leadership comfort zone by asking team members questions to unearth their ideas. What I found amazed me. They had ideas and ways of doing things far better than I and when entrusted to use them, became engaged and empowered like I had not seen before. And, so did I. I no longer felt like I was the leader pushing the boulder up the hill. I could now step to the back and see how our strategy pushing the boulder up the hill was working, and continue asking key questions along the way to bring about more effective effort and therefore, better results in shorter time. This is, by the way, the same way you train for an Ironman. After my first year of Ironman training, I hit a plateau in running. I wasn’t getting any faster. I could cover the distance, but I was slow. My coach and I had a conversation about it and found that I had limiting beliefs about running fast. I had always thought of myself as a recreational runner who liked to move at a deliberate pace, but take in the beauty of the run, not a runner who was a slave to the clock. And besides, it was painful to run fast! I could hang out all day running slow. But that wasn’t going to cut it for Ironman. There were time cut-offs I wouldn’t make if I didn’t speed up. My coach shared with me that she knew I could be a fast runner, that I had what it took and all I had to do was decide that’s what I wanted, just like I had with other things I had taken on and mastered. She said she saw this ability within me, and when someone says that and keeps saying it, you start to see it and believe it too. The same thing translated into leadership. When team members doubted their ability to do something, I shared my complete belief in them, adding questions to draw it through like: “what if you can do xyz? What will that feel, look and sound like?” Sure enough, they began to believe it too, and see themselves doing it. This is the biggest reason I used a coach. I wanted to do something and go to a place I couldn’t reach myself. My coach knew things and experiences I didn’t. I benefited from her knowledge, having gone before. As a favorite author, Andy Andrews, wrote: “We are the product of our best thinking. If we could do it on our own, we would have.” Sure, I could have done a bunch of research about triathlons and downloaded an on-line program, but my learning curve would have been much much longer and I would have made far more mistakes, some of which could have cost me successfully achieving my BHAG, in the short two years it ultimately took. I knew folks who had been pursuing Ironman for 10+ years and I wanted it more quickly than that. What I found in this and subsequent professional coaching experiences, including leadership, is that it is the velocity route to success and higher-level results. Period. I also found this to be true in leadership. In the two years of my Ironman pursuit, my team achieved results in business never before reached in its history. Each member also achieved higher results in their life and level of fulfillment, doing things they had never done before, and building on them. It’s a compounding effect. If this speaks to you, perhaps hire a coach and pursue that big, hairy, audacious goal you’ve been thinking of, perhaps never dared thought possible. I’m here to share with you, IT IS POSSIBLE! Let a coach help get you there.